Wife, children of Elad Salomon, murdered with his father and sister by terrorist in Halamish, visit WH as guests of Jason Greenblatt. Michal Salomon, who survived the terrorist massacre in Neve Tzuf (Halamish) in July, was welcomed into the White House, along with her five children, who also survived the murderous attack. The family was welcomed as the guests of US Special Envoy Jason Greenblatt. 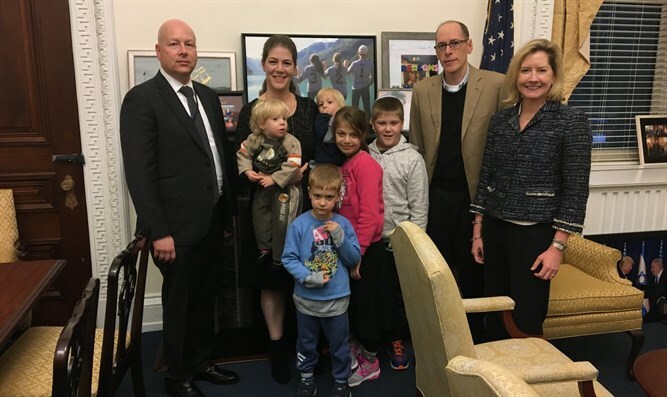 Greenblatt wrote on his Twitter account: "Privileged to welcome Michal Salomon, her 5 children & her father to the White House yesterday. Her husband, sister-in-law, and father-in-law were brutally murdered by a terrorist at the Shabbat table. Michal & her children escaped certain death only because of her courage." Michal's husband, Elad, was stabbed to death by an Arab terrorist as the family ate Shabbat dinner on July 21. Elad's father and sister, Yosef and Haya, were also murdered. Michal took her children upstairs to the room where the youngest children were sleeping and held the door closed to protect them from the terrorist.